1. First, I will behold the person of that child, making a comparison between what he is, as he is almighty God, and between what he is there, as he is man; with an affection of admiration, and love the greatest that I am able: pondering how this child is that God of majesty, whose seat id heaven, whose throw are the Cherubins, and whose servants the Hierarchies of Angels are, being in the maddest of them, as an Emperor, whom all do adore, and to whom all acknowledge subjection. And on the other side, he is laid in, a manger in the maddest between two dull and lumpish beasts: And he that is the word of the eternal Father, by whom he created all things, and who sustaineth them with his power, is become a child not yet able to speak, his hands and feet being swathed , and he not able to stir. And he whose vesture is the infinite light of the Deity, being the brightness of the glory of his Father: he who clothe his creatures with beauty, and with a liberal hand giveth them sustenance for the conservation of their life: he, even he, is wrapped up in poor mantles, and rags, and hath need to be sustained with the milk of his mother. O most excellent, and most humbled babe, and in all venerable, and amiable in all: yet, quango pro me vilior, tango mini carrier, the more thou art despised for me, the more worthy thou art to be loved: and the more thou art humbled, the more to be exalted: for in thy humiliations, thou demostratest the greatness of thy incomprehensible charity. O that I could love thee, as thou deservest: o that I could debase, and humble myself, as I deserve to be: for to debase me with myself, were to magnify me with thee. How is it (o my soul) that thou art not confounded to see this person so great, and yet so humbled: and to see thy own person so vile, and yet so proud! Learn of this Child to humble thyself: for he that with him shall humble himself on earth, shall by him be magnified, and exalted in heaven. 2. Secondly, I will ponder the words this child might speak, not with the tongue, but with the spirit: not with voice, but with examples. To his eternal Father, he might speak, giving him thanks; because that hour has come, and that it was his pleasure to have him laid in that manger, offering unto him with great love all the afflictions that he was to suffer in the world, and again saying unto him, that which the Apostle pondereth he might say in entering into the world, he added: Behold me here (o Lord) I am come to accomplish thy will. To men he spake likewise, and cried out totem with his examples, speaking that from the manger, which he afterwards spake while he preached: Learn of me, for I am meek, and humble of heart: and unless you be converted, and become as little children, you shall not enter into he kingdom of heaven: and whosoever shall humble himself as this child, he shall be greater in the kingdom of heaven. These, & other like words he is there preaching by his example,which I am to hearken unto with great devotion, beseeching him to open the ears of my heart, that I may understand this language, and put it in practice. O sovereign child, that even from this manger art inviting me to become a child, and wast always so great a lover of little children, that thiu didst lovingly embrace them: make me like thee, a child in innocency, a little one in humility, an infant in silence, and tender in charity. In these four things consisteth the making ourselves children, to become great in the eyes of almighty God. 3.Then will I contemplate the works that he doth: wherein there is one marvelous thing to consider: for being a man as perfect in judgment as when he was thirty years old, he did all the actions, gestures, and semblances of a child, not counterfeited, nor gained, but really, and truly, as other children do, with an admirable harmony, for him that knoweth how to ponder the connection of these two things together. In particular I will now ponder that weeping of the child, and the cause of his tears: he weepeth not so much for grief of what he suffereth (as other children do) as for that which we suffer by our sins, lovingly be wailing them; and with those tears joining interiorly most zealous prayers to the eternal Father, doing that St. Paul said of him: That in the days of his flesh, he offered prayers, and supplications to god with great clamor, and tears. And it is to be believed, that the blessed Virgin wept, seeing her Son weep, & considering the causes wherefore he wept. 4. Lastly, I will contemplate what things this child suffereth: which are, poverty, contempt, cold, and dolor, with other incommodities, all which he suffereth not forcible, nor of necessity but willingly, and pleasingly: for as he is God, and man perfect in judgment, he taketh choice of all that he suffereth. He chose to be born in the most rigorous time of the winter, in the coldest hour of midnight; in the most vile, and contemptible stable of all the city; with the greatest property, contempt, and forgetfulness of men that was possible: and all with such a mask of humility, that being voluntary, it seemed forced, and consequently most vile, and contemptible. Finally, from the manger (as he himself saith in one of the Psalms) he took forces inseparable companions even until death, poverty, contempt, dolours, and afflictions, electing such a manner of life contrary to that of the world, to discover by his example the deceits, and errors of wordings that follow the same. For as St. Bernard sayeth: It is a matter very evident that the world erreth, choosing for his companions, riches, honors, and delicacies, when as Christ the infinite wisdom, who can neither deceive himself, nor beguile us, chooseth the contrary. With this consideration, I am to confound myself in the presence of this most blessed babe, seeing how contrarily I have lived to that, which he teacheth, purposing to imitate him from hence forward, choosing to suffer what he suffereth, and beseeching him to make worthy to suffer with him, and like him, not of necessity, but gladly, & willingly for his love. 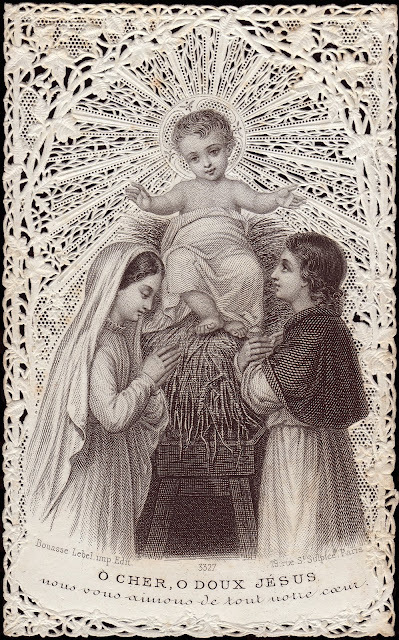 O sovereign child, who like another David, art the wisest prince among three: for of the three divine persons thou art the second, to whom wisdom is attributed: what doest thou seated here in this chair of the manger, being silent, without speaking unto us? thou art the most tender little worm of the wood, that violently killest eight hundred: for with the contempt, and humiliation that thou hast in the worm-eaten wood of thy poor harbor, thou killest with the violence of thy divine love, the innumerable violences of the love of the world. O most wise, and most valiant prince which silently instructs, and silently killest, teach me to follow with silence thy contempts, and kill in my heart worldly affections, that making myself a worm in imitation of thee, I may merit to ascend to behold thee in the throne of thy glory, Amen.